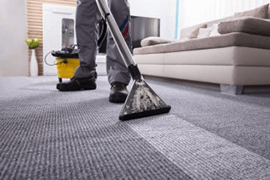 How often do you clean your carpets? If it's being neglected, dirt can build up and cause serious damage. Over time, you could be dealing with problems that are a lot bigger than the carpet stains you see every day. When your upholstery is in bad shape, it's pretty hard to ignore. Your chairs, curtains and couches used to be spotless, but now they are plagued with everything under the sun — and whatever is under the couch too. A pristine kitchen or bathroom is a glorious sight. But what if you can't get the dirt out of every crack and crevice? 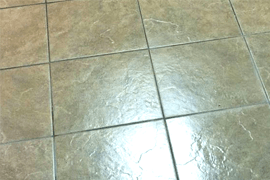 The bacteria and buildup that has set up camp in your grout seems to stand out even more now that everything else in the room is sparkling clean. Rest assured, your tile is not ruined. Grout cleaning services are just the thing you need for a seamless result. 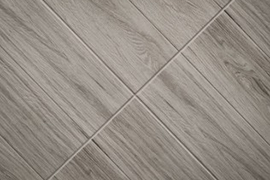 Vinyl Ceramic Tile is great for many reasons, such as its long lifespan and extreme durability. VCT is usually installed in busy places like commercial spaces, schools and grocery stores where there is high foot traffic. We appreciate all of our customers, and we value your reviews! We strive to earn your loyalty, and live up to 5-star reviews with every customer we serve. Quality of service is important to my wife and myself. Joe and his staff did a excellent job of cleaning the carpet in our home. In addition to our carpet being CLEAN, they were also very neat and professional. 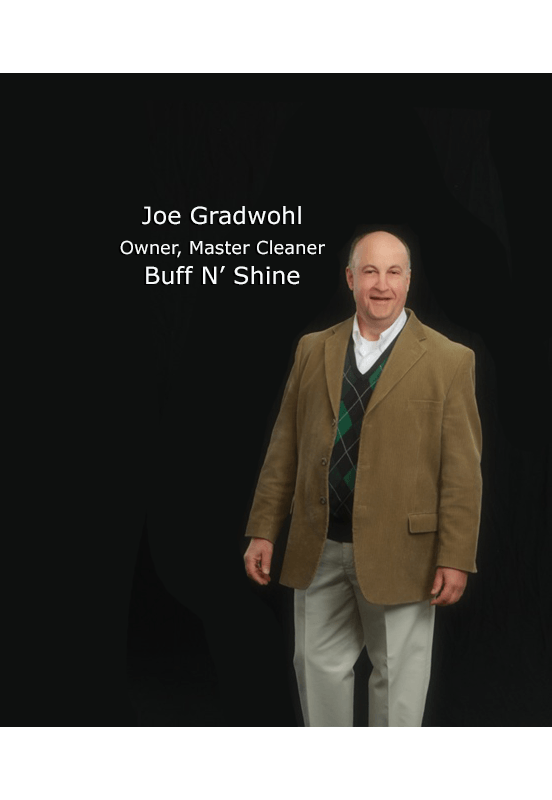 I would strongly suggest if you want a quality carpet cleaning done right, call Joe Gradwohl at Buff N'Shine. Dear Joe, Sandy and I are really pleased with your service. You and Manuel did a fine job (again!) and the carpet looks great. We will certainly recommend you to our friends and would be happy to serve as a reference – though I suspect that you already have lots of those. Great job. Thank you! 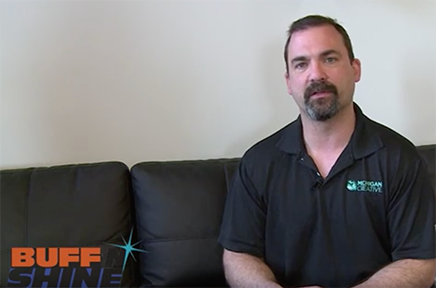 Having had our wood floors professionally treated by Buff N' Shine for three consecutive years with excellent results, I felt comfortable entrusting the carpet cleaning to Joe and his staff. We were not disappointed because the carpets were cleaned with the same professionalism as before. Joe was happy to come clean my carpets on Saturday with short notice. He and his crew took great care of my furniture and conquered many unidentified spots and stains. Made a 14 year old carpet look great. 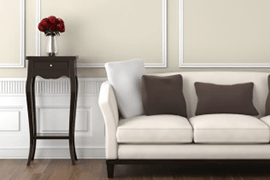 Excellent - the best - thorough, efficient, uses good products, gets carpets & upholstery really clean and gives professional concern and attention, friendly, aims to satisfy and always willing to return and retreat any area, careful to protect our furnishings, walls, and hardwood floors from your equipment and as you work. I am so pleased – my carpeting looks new again. I had thought about replacing it – but really couldn't afford to. Would I use Buff N' Shine again? YOU BET I WOULD!!! I will be a repeat customer. The patience shown to myself as an older person. As the carpet was cleaned I was allowed to ask questions as to the chemical use in carpet cleaning. Prompt, courteous, professional, careful. The fact that you call ahead and that your service people wear shoe booties to protect against dirt tracking. Decent people who are conscientious and do a good job. I am glad that I learned special maintenance tips, like to change my vacuum cleaner bag sooner than I realized. The most recent cleaning was the best yet! They were on time, worked efficiently, and were polite and pleasant. When they left the carpets were beautifully cleaned and the finishing touches were well done.